Untreated displaced fractures (espcially sagittal plane angulation) can lead to transfer metatarsalgia and chronic pain. 1st MT: shorter and wider; bears 1/3 of body weight via tibial and fibular sesamoids. Tibialis anterior insertion provides varus/supination/elevation forces; peroneous longus insertion provides valgus/pronationdepression forces. Lesser MT's: bear 1/6 body weight each. Pain, swelling in the forefoot. 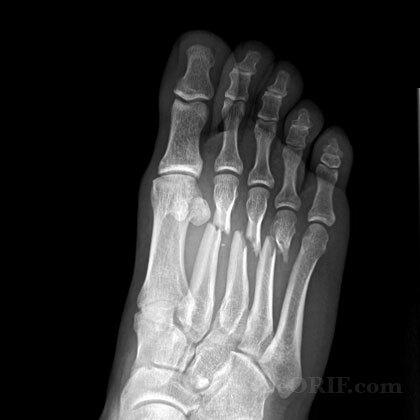 Xray: A/P, Oblique, Lateralfoot views generally demonstrate fracture. CT: consider if associated midfoot fractures are possible. Nondisplaced 1st metatarsal Fracture= NWB cast for 6 wks. CPT 28470-closed treatment without manipulation. CPT-28475-closed treatment with manipulation. 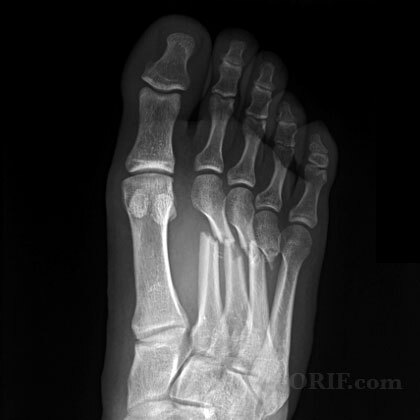 Displaced 1st metatarsal Fracture= ORIF, generally fixed with plates/screws. 1st metatarsal must be treated to preserve the head as a major wt bearing point. Nondisplaced isolated lesser metatarsal: hard soled shoe and progressive WBAT. Displaced isolated lesser metatarsal: closed reduction and casting for 3 wks, followed by hard soled shoe and progressive WBAT. Nondisplaced multiple lesser metatarsals: hard soled shoe, brief period of NWB follopwed by progressive WBAT. Post-op /Initial: NWB, Hard soled shoe. Elevation. 7-10 Days: xray to ensure reduction is maintained. Continue hard-soled shoe, may brpgress with weight bearing depending on fracture stability, activity modifications. 6 Weeks: Remove k-wire. Advance weight bearing in hard-soled shoe dependent on fracture union on xrays. 3 Months: Resume full activities based on union. Consider bone stimulator if union not evident on xray. 1Yr: assess outcomes / follow-up xrays.